Wisteria floribunda 'Multijuga' is renowned for long recemes of beautiful lilac flowers that hang down gracefully. Racemes measuring 1 metre in length have been spotted in the UK and in Japan they are known to grow even longer! The sweetly scented flowers are violet with darker purple markings and appear as the vibrant green leaves emerge in spring. 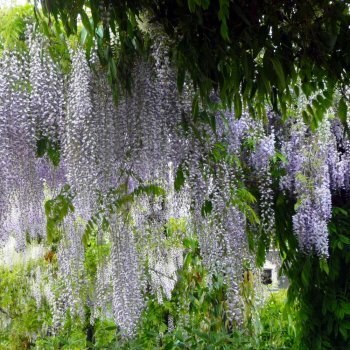 Growing well in sun or partial sun, Wisteria 'Multijuga' prefers moist, well-drained soil. We think it is best grown against a sunny wall using support wires, trained over a pergola or above a window so the racemes can be enjoyed from inside. Multijuga can also be trained (using a tree stake) as a freestanding Wisteria tree. It is no surprise 'Multijuga' holds the RHS Award of Garden Merit and as our Wisteria are grafted, they tend to flower younger than those grown from cuttings.